US-based Egg celebrates the bond that connects all families. 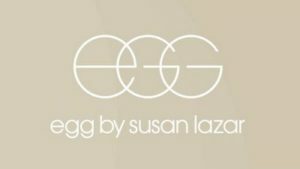 Egg is designed around the needs of stylish mothers and their children with natural fabrics and clean modern designs at an affordable luxury price point. The result is fashionable, yet timeless, baby and children’s clothing of the highest quality. With Big Apple Buddy’s personal shopping service, you can now buy direct from the Egg Baby online store anytime, anywhere. 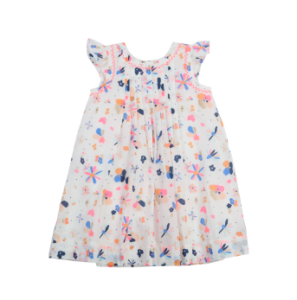 The Egg flower burst cotton flutter sleeve dress is feminine, colorful and incredibly sweet. With a bright flower burst print, and bold neon accents, your little girl will be sure to stand out. Its features include neon pink stitch detail at the collar and sleeve, front pleat detailing, as well as a full liner and an exposed brass zipper down the back. The Egg Girls Watermelon Ruffle Shoulder Swimsuit is a fun, tropical one-piece your child will love. It's fruity, fun and perfect for the beach, pool parties and family vacations. It features a wide ruffle band from the shoulder to the back, two fun prints and UVF 30 protective fabrication. 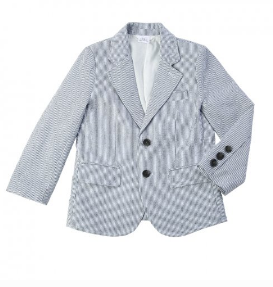 Achieve sophisticated summer style with the Egg Classic Seersucker Blazer! Perfect for weddings, formal events and parties this blazer features two front flap pockets, and a hidden inner chest pocket. Pair it with matching seersucker trousers for a dressy look or a light wash denim or white chino for a more casual look. Unfortunately, the USA Egg Baby online store does not currently offer international shipping. However, Big Apple Buddy, your personal shopper, can help you buy products direct from the official USA Egg Baby online store and ship them to your doorstep, no matter where you are in the world. We offer international shipping to over 190 countries including Australia, Austria, Bahrain, Belgium, Bosnia & Herzegovnia, Brazil, Brunei, Canada, China, Croatia, Cyprus, Denmark, Estonia, Finland, France, Germany, Hong Kong, Hungary, India, Indonesia, Ireland, Israel, Italy, Japan, Kenya, Kuwait, Lithuania, Luxembourg, Macau, Malaysia, Maldives, Mexico, Namibia, Netherlands, New Zealand, Norway, Oman, Pakistan, Philippines, Portugal, Saudi Arabia, Scotland, Serbia, Singapore, Slovenia, South Africa, South Korea, Spain, Sri Lanka, Sweden, Switzerland, Taiwan, Tanzania, Thailand, UAE, UK and Ukraine. If you would like to buy from the USA Egg Baby online store, simply let us know which items you would like to order (by filling out the form on the right) and we’ll get back to you with a free international shipping quote within 24 hours!